Longtime activists Daniel Ellsberg, who leaked top-secret Vietnam War documents, was rushed out of a military hearing Monday morning after he tried to speak to PFC Bradley Manning. At a break in the proceedings, Ellsberg stood up and walked toward the front of the section for spectator sitting and leaned over to talk to Manning at the defense table. Military police moved in quickly and grabbed Ellsberg by the arms and walked him out outside..
Ellsberg was later allowed to return after he told security officials he was unfamiliar with the courtroom rules that prohibit contact with the defendant. WikiLeaks while he was serving as an intelligence analyst in Iraq in 2009 and 2010. Ellsberg, who was born in 1931, is known for leaking the top-secret government analysis of the government policy during the Vietnam War that became known as the Pentagon Papers. He is an outspoken critic of government secrecy and has become an advocate for Manning. "I wanted to tell him I was here, that one of his supporters was here," Ellsberg said later, outside the courtroom. "I didn't know the rules. It was my first day." In a separate incident, another activist, Dan Choi, scuffled with military police outside the courthouse at Fort Meade. Security official said Choi, best known for his activism against the previous policy of Don't Ask-Don't Tell, the ban on gays and lesbians serving openly in the U.S. military, had been heckling. At one point Choi scuffled with MP's who wanted to take him into a trailer that is part of the courthouse complex. Choi grabbed on to a handrail and the police had to pry his fingers loose before taking him inside, away from journalists. He was handcuffed but later was seen, without restraints, being escorted from the courthouse compound. Military officials said he would not be allowed into the courtroom but no charges would be filed. 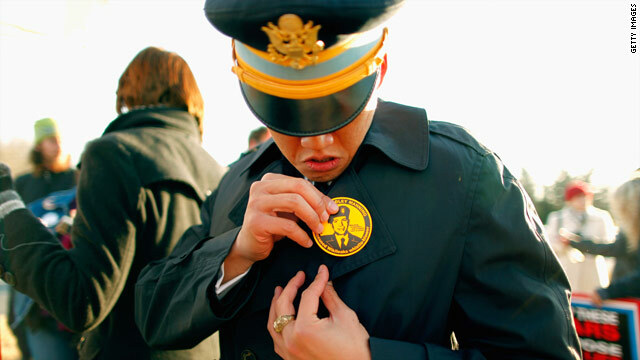 On his Twitter feed, Choi said he was "pinned to ground" and that the military police "ripped off my rank." A base public affairs officers said the rank fell off. One of the people offering legal assistance to Choi was Jennifer Robinson, a legal adviser to WikiLeaks founder Julian Assange, who is observing the trial. Several Manning supporters were in the courtroom Monday morning. Scott McCullion of Bishopville,, Maryland was wearing a shirt emblazoned with Manning's picture. "I'm here just to support him," McCullion said. "I was against the pre-emptive war in Iraq." Kent Lee Holland, a retired history teacher from Hollywood, Florida had interrupted a trip to New York to observe the hearing. "This is a democracy; we're supposed to know what's going on.